The less than anticipated crowd at the beginning—about fifty persons—more than doubled in size as the demonstration reached its destination, having been joined by others, including some in cars and onlookers with a vantage point from their office windows. 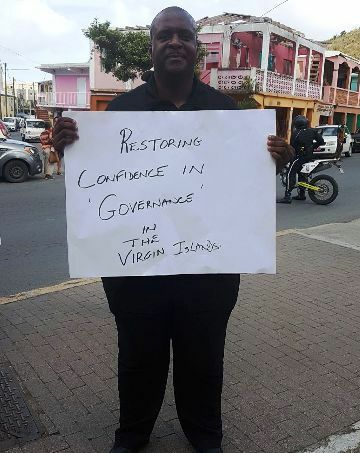 Leader of the VI Political Opposition, Honourable Andrew A. Fahie (R1) was among the speakers addressing the gathering, and used the occasion to again call on the NDP government to embrace the principles of accountability and transparency. 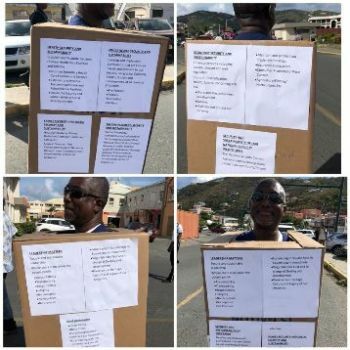 Former Permanent Secretary in Virgin Islands government, businessman Julian Willock was also among the high profile Virgin Islanders, to defend against the critics of the march and its timing. 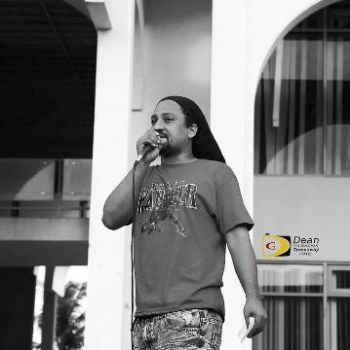 Historian Dr. Quincy F. Lettsome, speaking to the enthusiastic gathering, gave a brief history of slavery in the islands while another of the presenters, was Ms Shereen Flax-Charles of Virgin Gorda. She used her time to speak primarily to women empowerment, among other concerns shared by those inhabiting the sister islands. Peoples’ March organiser, ‘Heritage’ Burnett, presented a petition to government with over 70 grievances which he had read aloud. 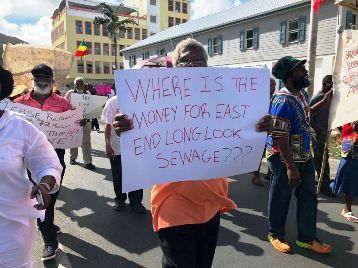 The petition was received by the acting Premier, Dr the Honourable Kedrick D. Pickering (R7), since Premier, Dr the Honourable D. Orlando Smith, was on overseas duties in Asia, along with Health and Social Development Minister Ronnie W. Skelton (AL). 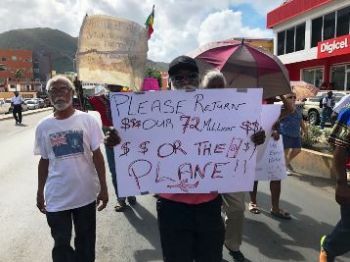 The ‘Peoples’ March’ saw support also coming from Honourable Julian Fraser RA—Third District Representative and Opposition member. Other elected members in the House of Assembly however, snubbed or likely boycotted the event since the ‘Peoples’ March’ was in fact a demonstration against the NDP government. The petition filed on behalf of the demonstration was copied to the United Kingdom appointed Governor Augustus J. U. Jaspert. The peaceful march ended just after 5:30PM and was shadowed along the way by a heavy police presence. At least it was held - better late than never! No heavy police presence was needed, we always march, but never violent. @NezRez, get use to it. I have been a specator at marches and rallies in other Countries and States and there is always a large police presence. Maybe this is new to you but the police is there to protect the marchers. repeatedly toyed with and violated. where i come from everyone has quite a number of guns for defence. i see why you outlaw that here - so bad people can have their way. stupid. feel good some of them will feel bad after June 23, 2018 you watch! I think that march should have been planned and organized better than that. A better time like maybe 4pm or 5pm may have been a bit more suitable for people who get off work around that time. Boy Willock I was looking for you in the march but I did not see you. Looks like you were invisible.